A pile of records and a record player. For every record we have one story at the ready. 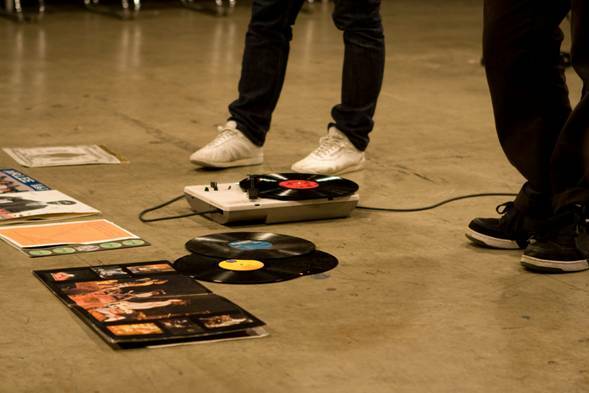 For each performance we will play different records in a different order and tell the stories that go with them. This creation by PME-ART – part five of the HOSPITALITÉ-HOSPITALITY Project – explores the way music infiltrates our personal and social lives, affecting our ongoing understanding of love, work and how we think society should operate. Focusing on artistic collaboration, the work of PME-ART is an ongoing process of questioning the world, of finding the courage to say things about the current predicament that are direct and complex, of interrogating the performance situation. PME-ART’s past works include the installation HOSPITALITY 2: Gradually This Overview, and the performances HOSPITALITY 3: Individualism Was A Mistake and HOSPITALITY 1: The Title Is Constantly Changing, as well as Families Are Formed Through Copulation/La famille se crée en copulant, Le Génie des autres/Unrehearsed Beauty and En français comme en anglais, it’s easy to criticize. PME-ART’s performances have been presented over the last twelve years in thirty-five cities in Quebec, Canada, Europe, Japan and the United States. In 2012, PME-ART was nominated for the Conseil des arts de Montréal’s Grand-Prix and was short-listed for the first 1% dedicated to performance art (Integration of Art in Artchitecture Program), commissioned by the new building 2-22 art actuel, in Montréal. A PME-ART creation, in co-production with FFT-Düsseldorf. In collaboration with Studio 303 and the Norderzoon Festival-Groningen. PME-ART would like to thank The Conseil des arts de Montréal, The Conseil des arts et des lettres du Québec & The Kunststiftung NRW (Germany).